Karim Benzema fractured his finger in Real Madrid's win at Real Betis, coach Santiago Solari has confirmed. Benzema suffered the injury during Sunday's 2-1 victory at the Benito Villamarin, which was sealed by a late Dani Ceballos free-kick. Striker Benzema fell heavily on his right hand and was in obvious pain as he left the field shortly before the half-time interval. Benzema did not return to the pitch for the second half with Solari sending on Cristo Gonzalez for his LaLiga debut. 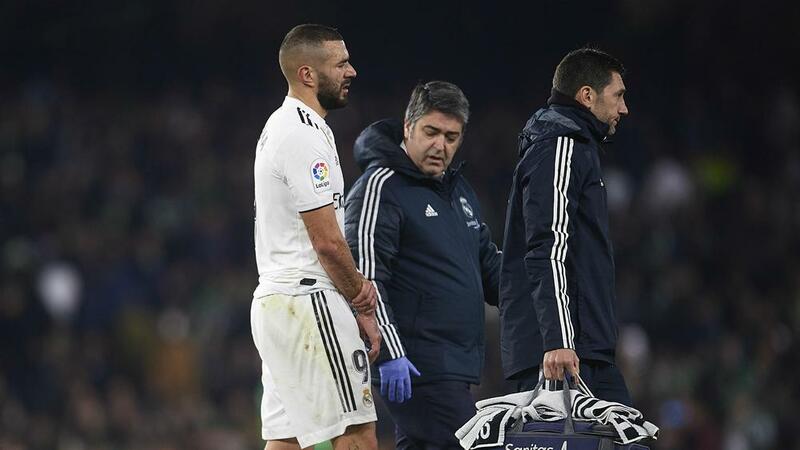 Solari confirmed Benzema fractured his finger in a post-match interview but gave no expected timescale for his recovery. Madrid are already without forwards Gareth Bale and Mariano Diaz, while regular starters Toni Kroos, Marco Asensio and Marcos Llorente all missed the trip to Seville. Solari's side are in Copa del Rey action away to Leganes on Wednesday, holding a 3-0 lead from the first leg of the tie. They then host Sevilla - who are third in the table, level on points with Madrid - in a crunch LaLiga clash on Saturday.